The lead experiments used a clay pot as the pedestal with a clay saucer to represent the containment structure floor. This experiment used the minimum estimated core melt volume and converted it into a scaled down amount of lead. 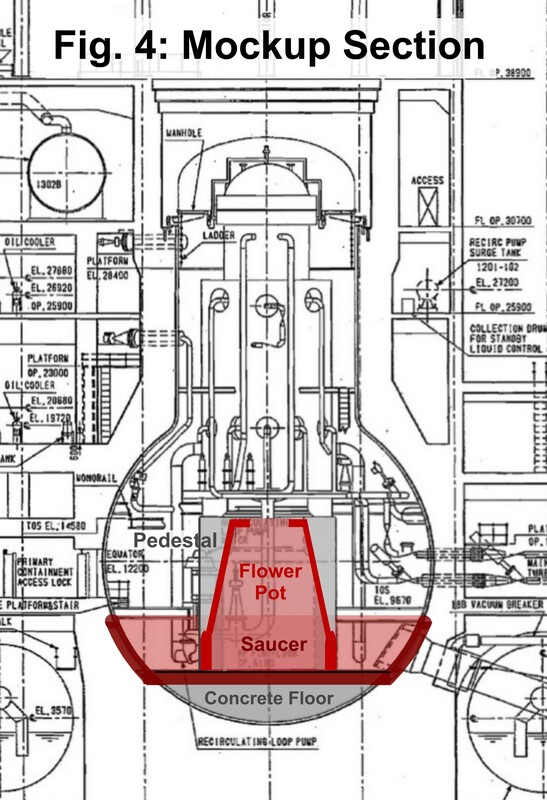 A tea mesh strainer was used to hold the lead above the pedestal as a rough stand in for the bottom head of the reactor vessel. 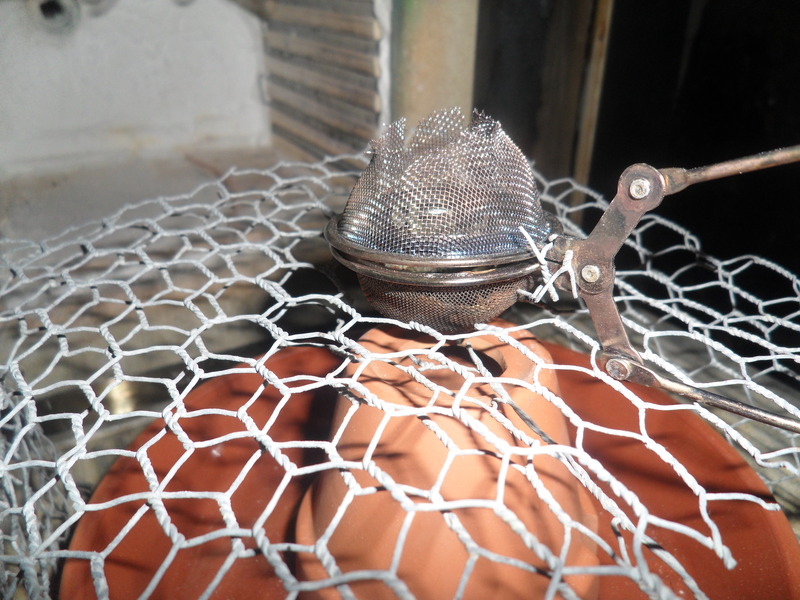 The strainer was suspended over the pedestal using a piece of steel garden mesh to prevent contact with the pottery. 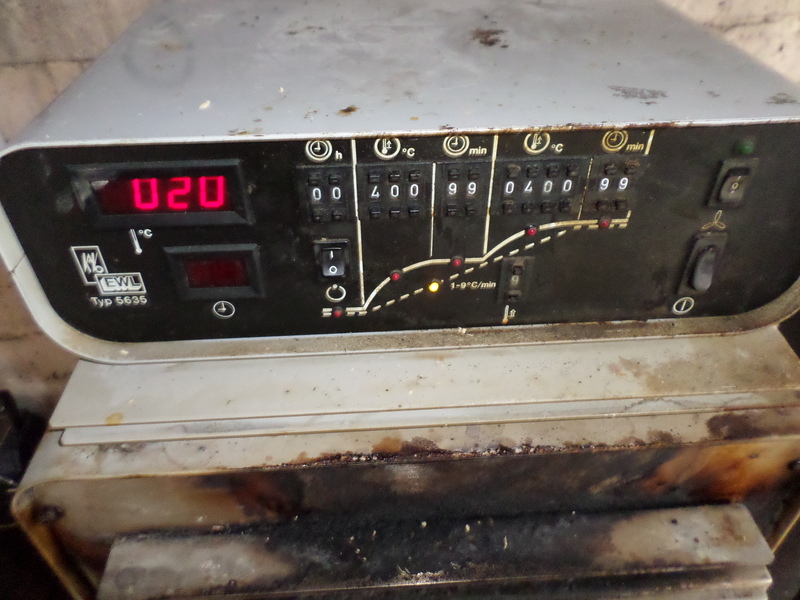 The melt process was taken to 400c and held there for one hour. 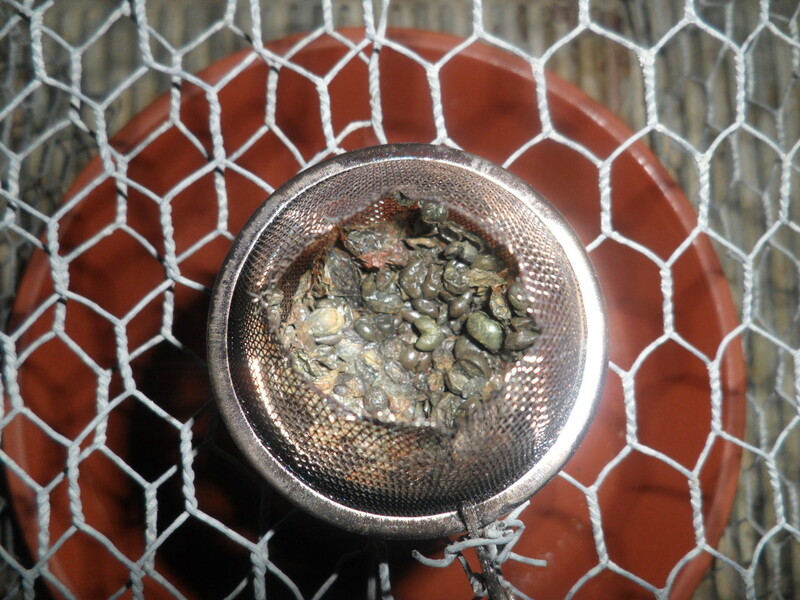 Corium minimum volume: 17.5 m³ Scaled down to 1:116 in lead: 125 g (11 ml) Melt height: 6 mm lead melt height translates to 70 cm real height About 20g of the lead volume stayed in the strainer due to oxidation and possible residue or coating on the lead pieces. More information about the process and results are inline among the images. 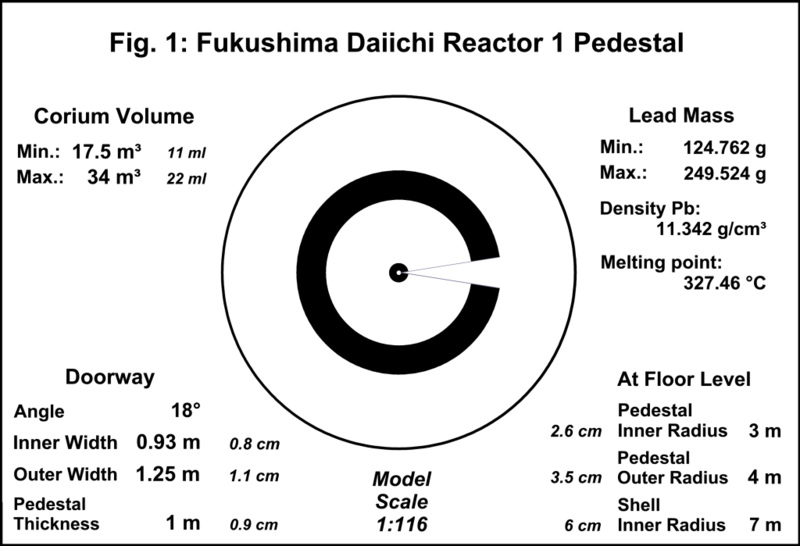 Calculations and documented sizes for the example BWR Mark 1 reactor based on Fukushima Daiichi unit 1. 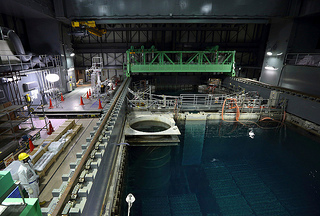 Corium volume based off of Sandia National Lab’s computer modeling of Fukushima Daiichi unit 1 meltdown progression. The pottery examples superimposed over the Fukushima Daiichi unit 1 elevation drawing. 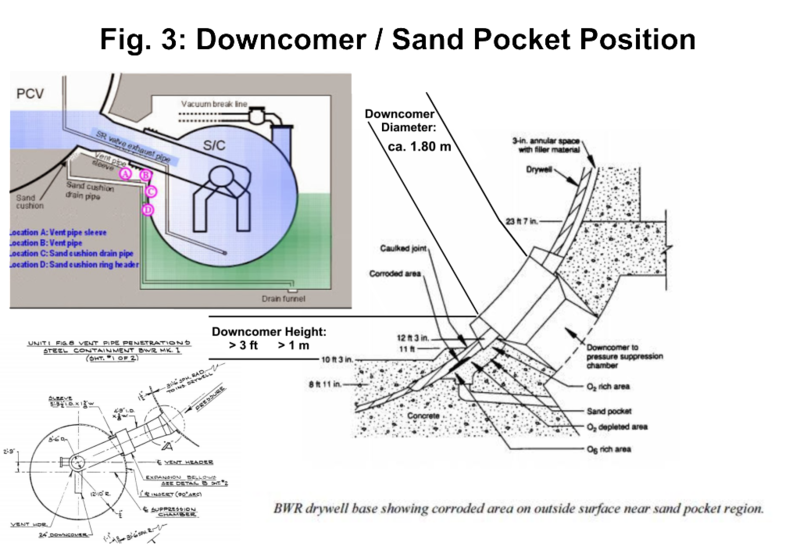 Detail showing the downcomer structure between the containment drywell into the torus (wetwell). 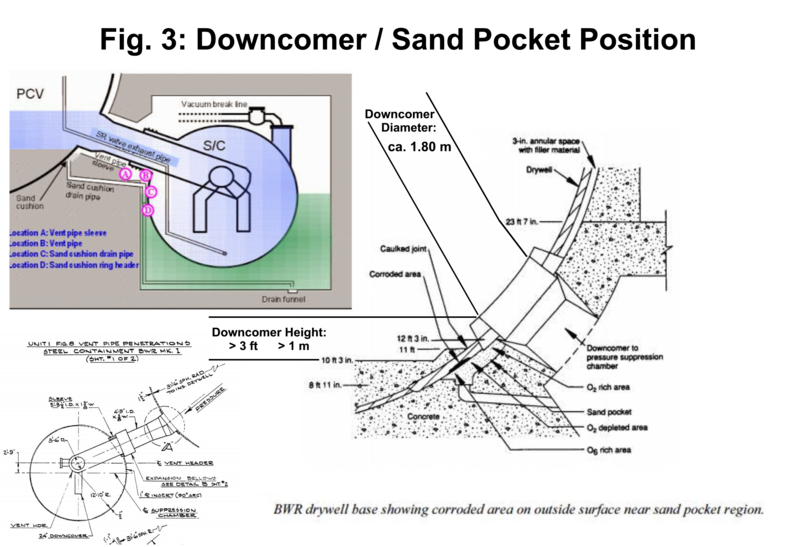 The right illustration details how the containment floor ties into the downcomer. This is the area of most concern for potential corium burn through. 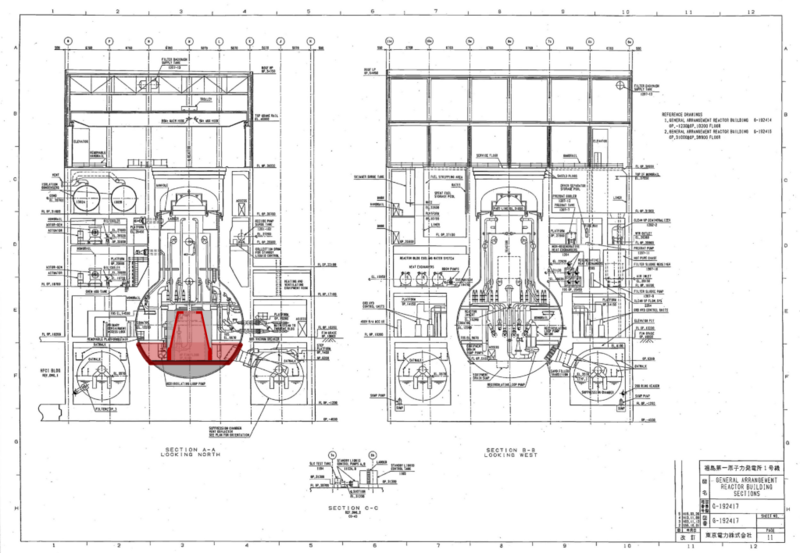 Diagram of BWR Mark 1 reactor vessel and pedestal cutaway. 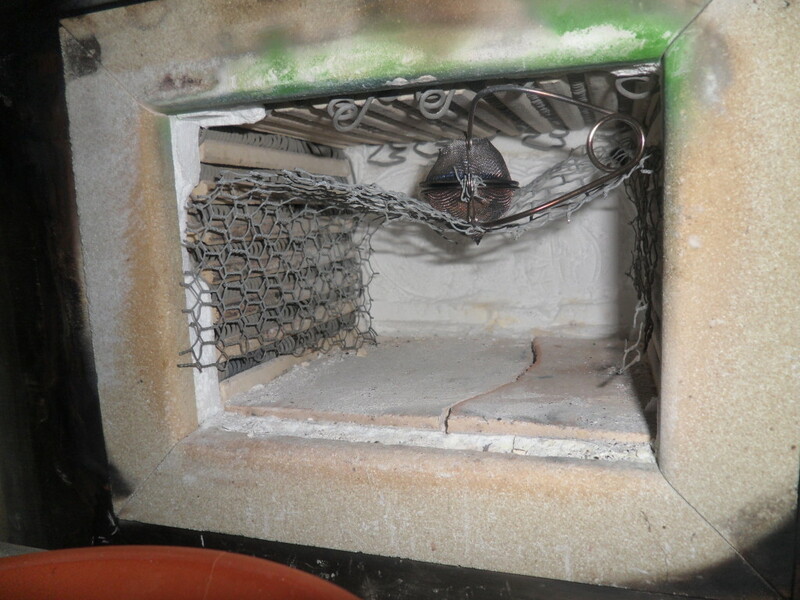 Configuration in the furnace with the strainer over the pedestal model. 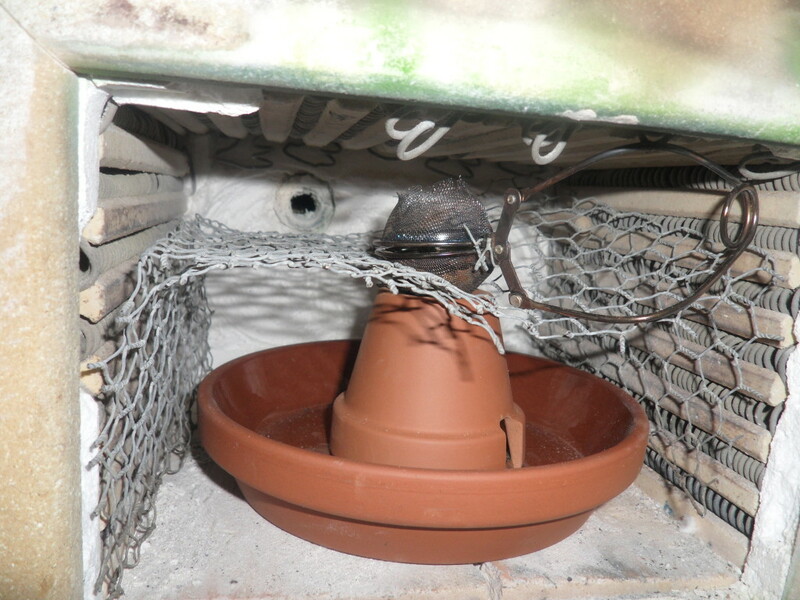 Furnace with the strainer in place. 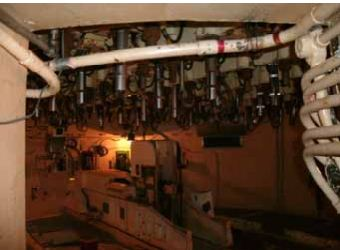 Temperature controller for the furnace during ramp up. 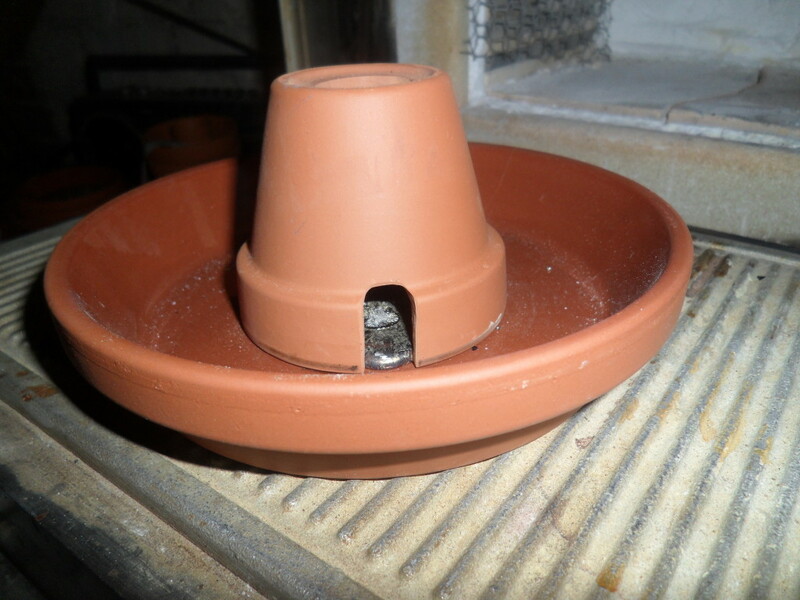 Ceramic pedestal and saucer after the melt run. 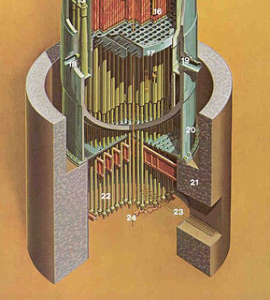 The lead mass can be seen trying to flow out the doorway of the pedestal. Strainer as it was held over the pedestal. Residue left in the strainer after the furnace run. Assumed to be oxides from the lead and residues that may have been used as a coating on the lead weights. 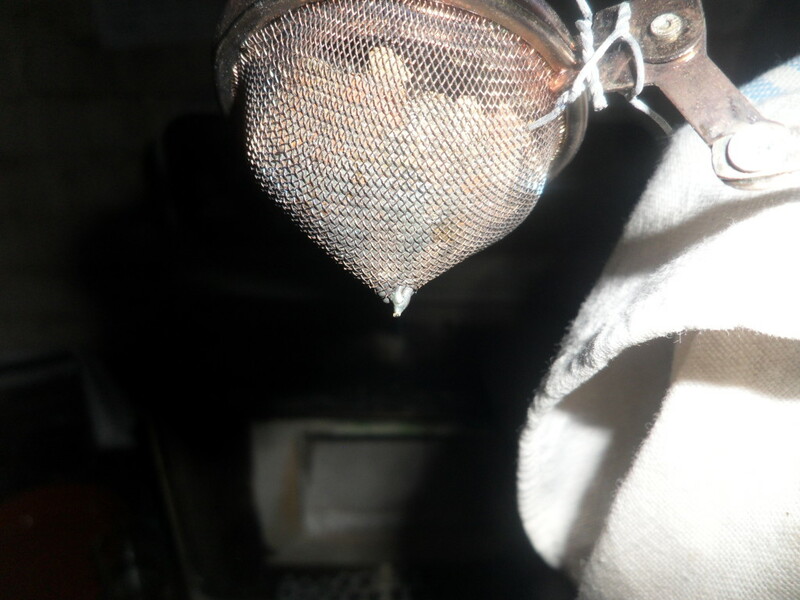 Underside of the strainer with melt residue. Overhead view of the pedestal after furnace run. 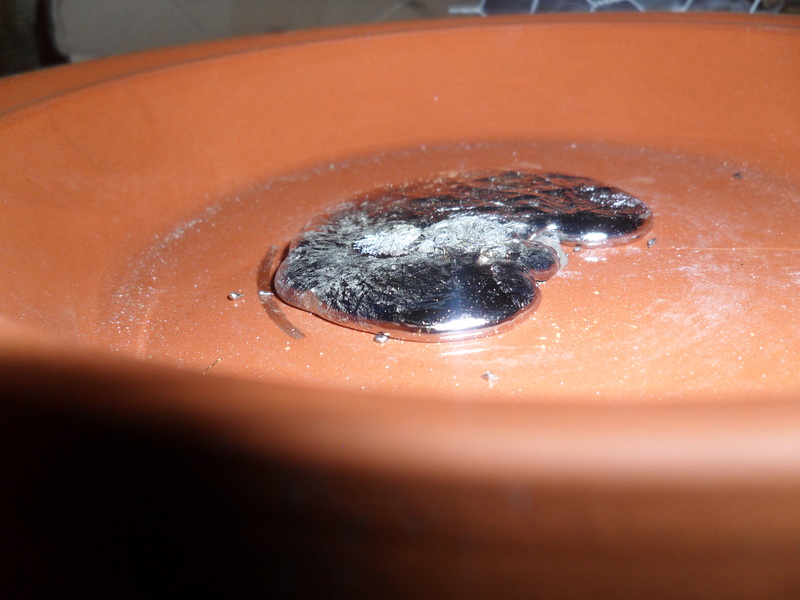 Lead melt seen attempting to flow out of the pedestal, photo taken after the furnace run. Lead melt after cooling. Black line shows where the pedestal was located. 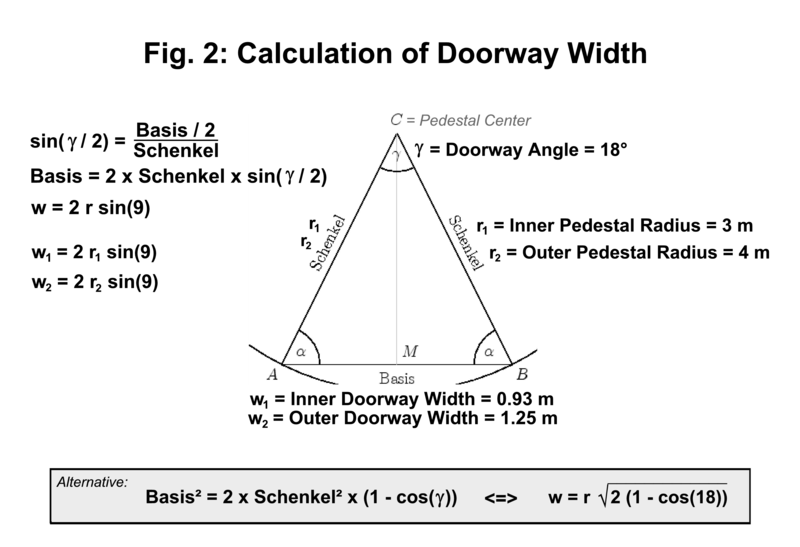 The curved bulge where the lead attempted to exit the pedestal can be seen on this image. 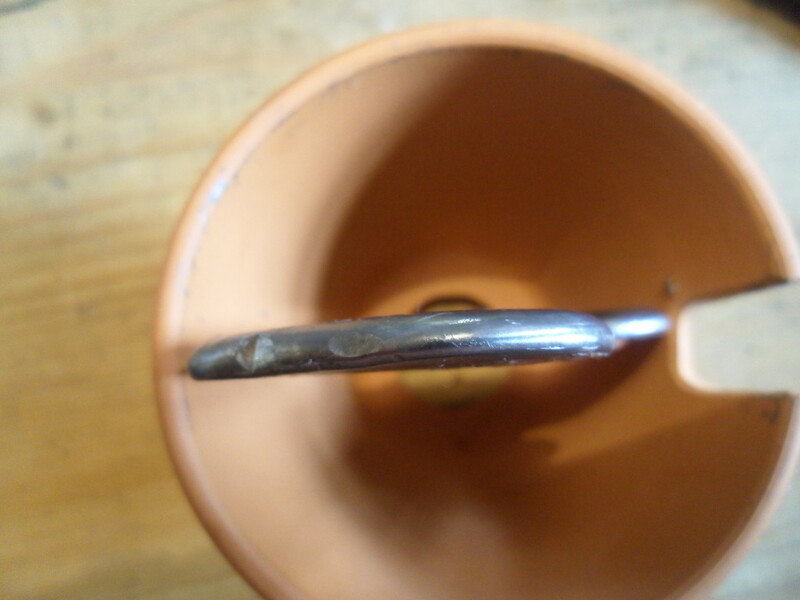 The lead melt did manage to move the pedestal slightly during the process. 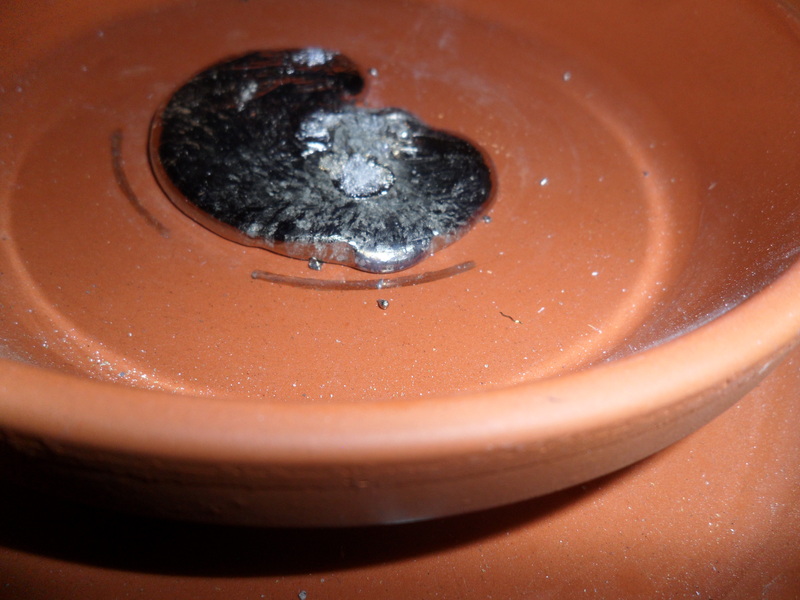 Another view of the lead melt. 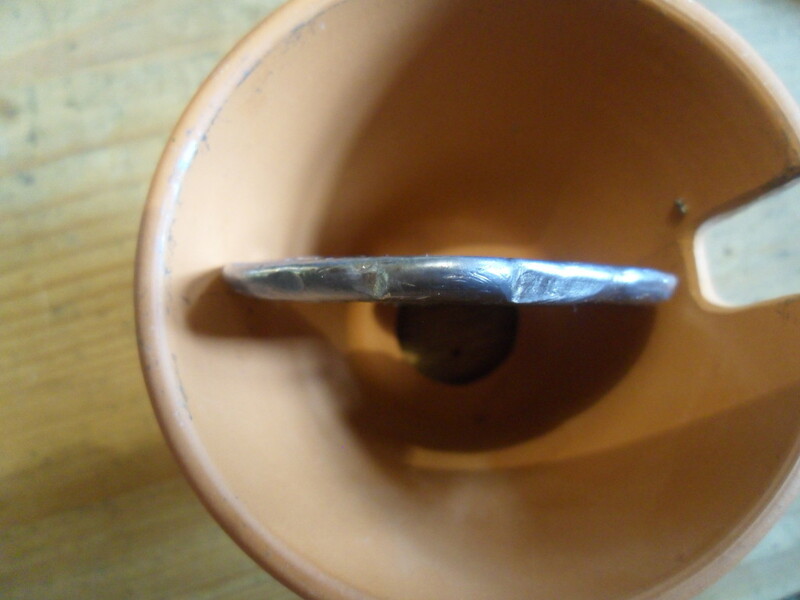 The lead did manage to score down into the surface of the ceramic saucer. The saucer had a slight glaze to it. 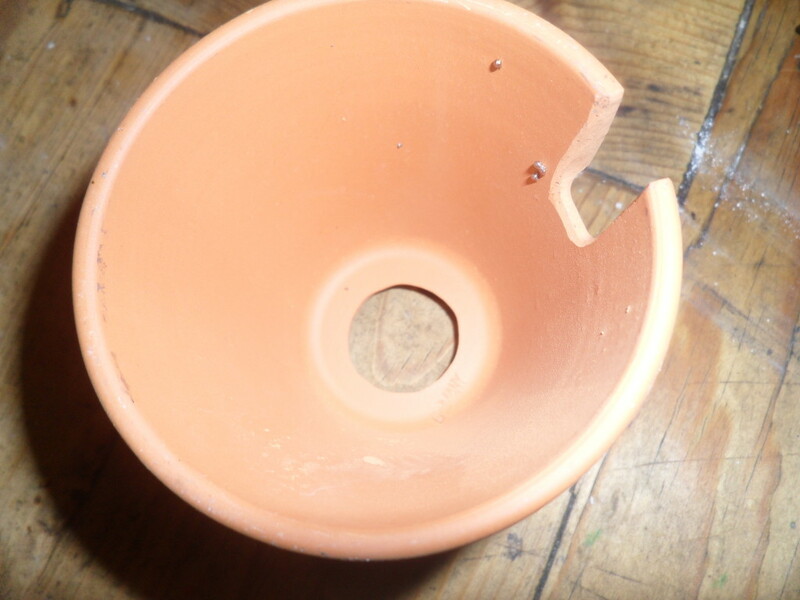 Currently not confirmed if it was a reaction with the glaze or the pottery itself. 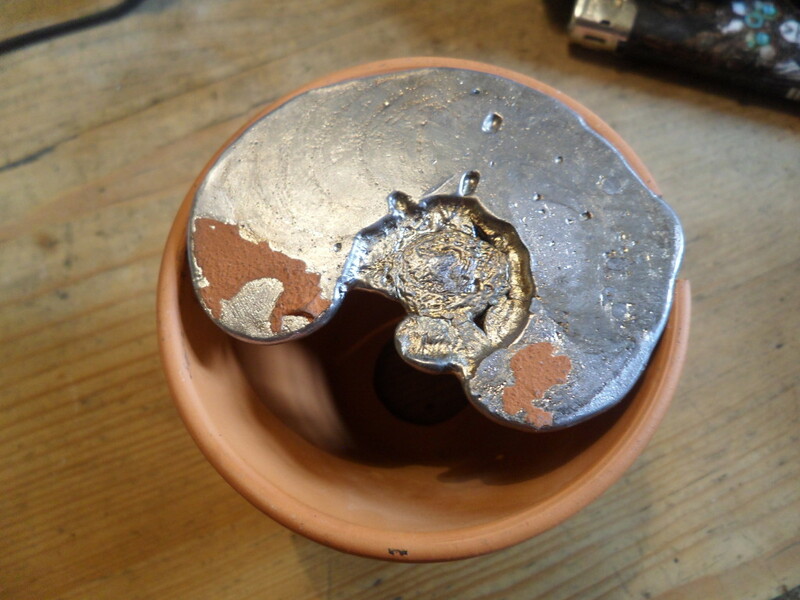 Another view of the cooled lead melt. The pedestal bulge can be seen to the left. Interior of the pedestal structure after the furnace run. Small droplets of lead can be seen adhered to the inner wall. 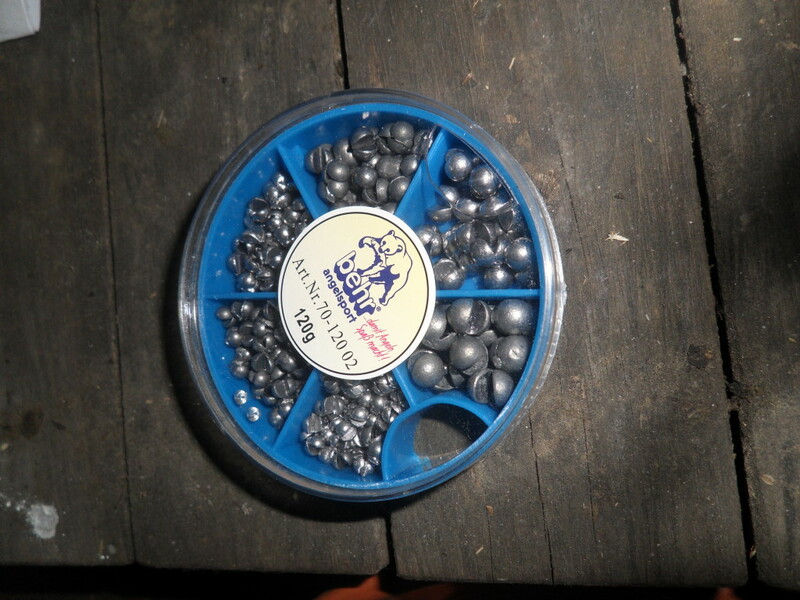 The lead mass removed. Areas where the pottery adhered to the lead can be seen. The central divot was due to a small amount of lead left in the pedestal from a previous run. The two lead masses did not merge together. 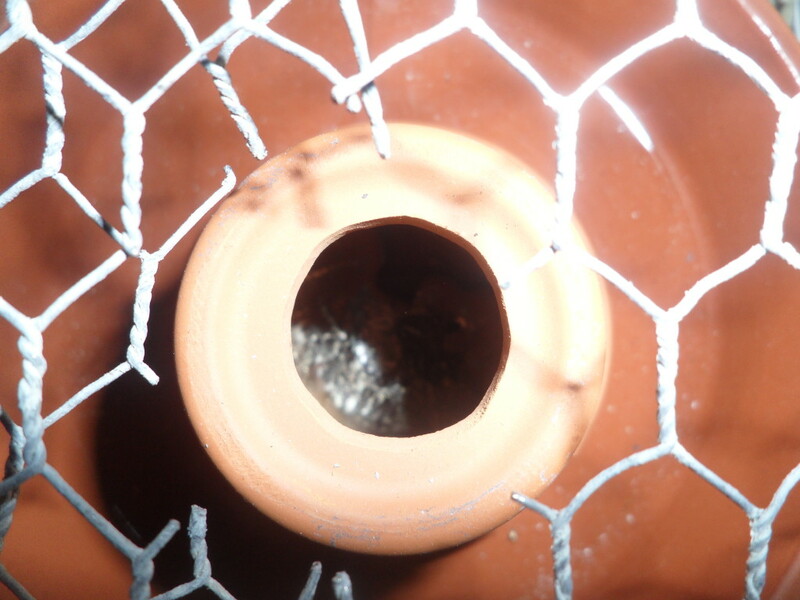 Very clear concentric circles can be seen as the lead flowed inside the pedestal. The flow paths can be seen in the lead by the rings left as the flow cooled and moved. 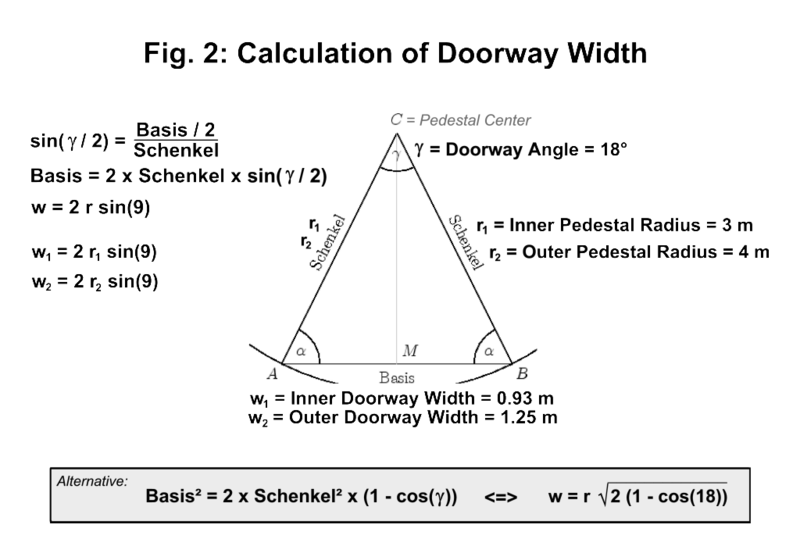 The bulge for the pedestal doorway can be seen along with how the lead took an easier path along the inside of the pedestal rather than flowing out. 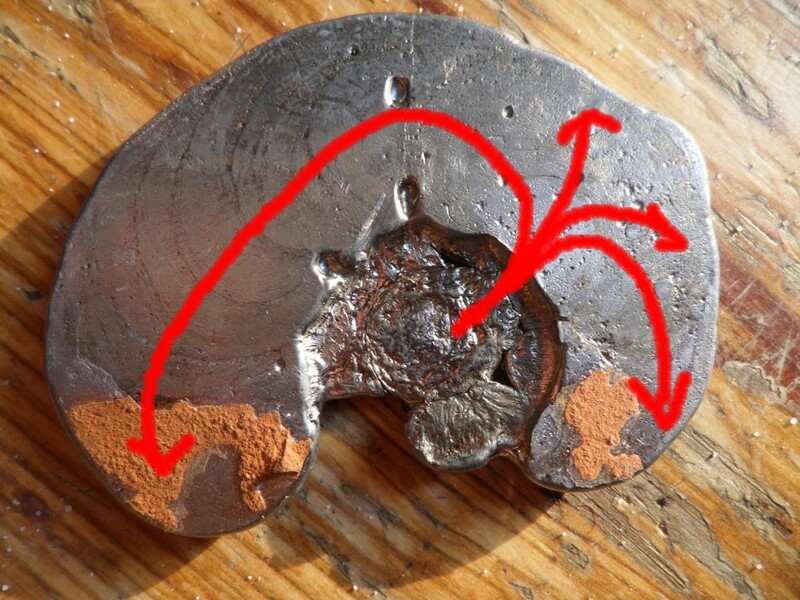 Lead melt set back into the inverted pedestal to show how it relates to the structure. 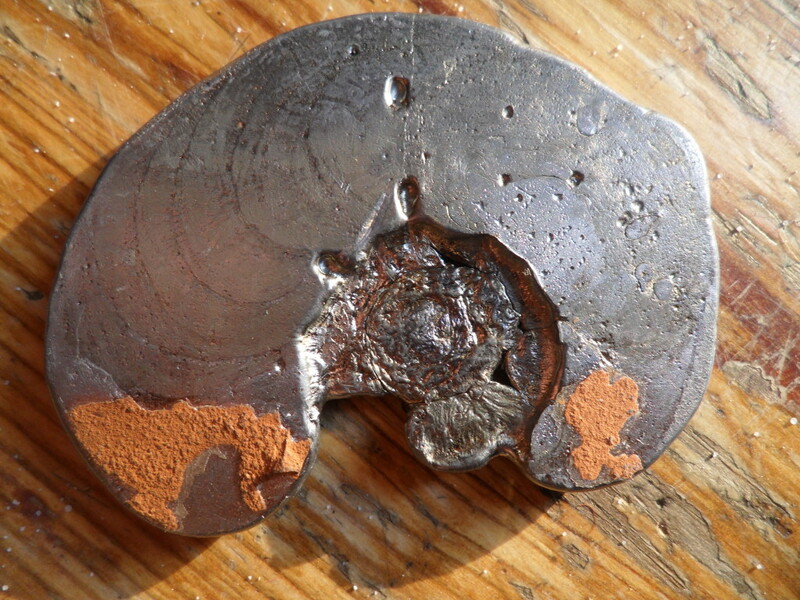 Side view of the lead melt shows the uniform level of the melt mass. The top of the melt did not have the concentric rings the underside does. Other side of the melt mass. 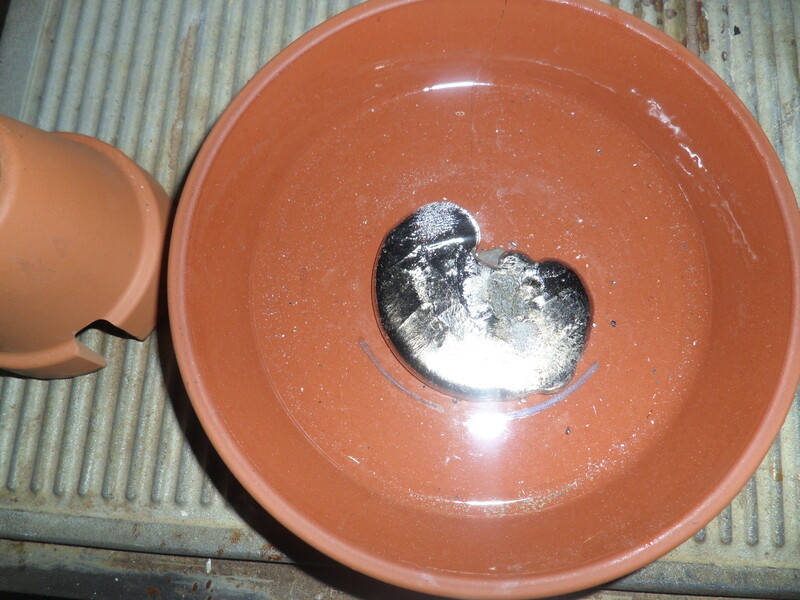 This attempt on the lead based corium experiments showed what might be possible with a smaller volume fuel melt. 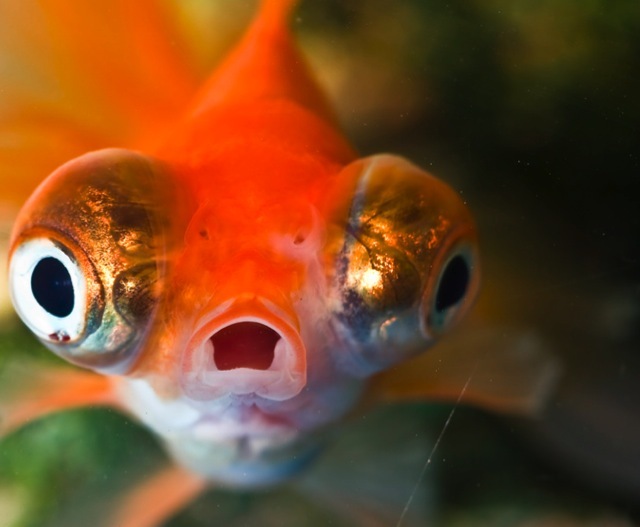 A second run will be conducted using the higher end of the corium fuel melt volume estimates. The earlier glass melt experiment used a volume closer to the higher end volumes and showed a considerable flow out of the pedestal but was done at a much higher heat and time. 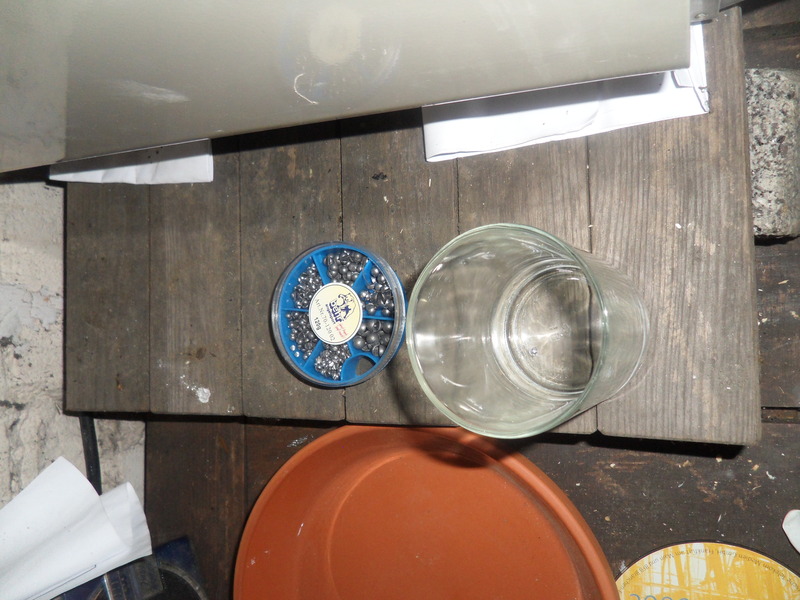 The second lead melt experiment should help confirm some of the differences in behaviors between the two experiments. This smaller melt did show some affinity for working towards the pedestal opening. Additional experiments should help confirm this.